Ronnie Christopher 5th Dan J.K.A.Interview By John Cheetham. Fudo Dachi-Sochin Dachi 'Variations on a theme'. By J.Cheetham. Keigo Abe 8th Dan. 'A Modern Day Samurai' Interview By Mike Clarke. 'The Kawasoe Experience'. Course Report By John Cheetham. The Relationship Between TAI CHI and KARATE. By Ian Deavin. Training at the J.K.A. 'The PRO'S and CON'S'. By Michael Powell. One of the most dynamic and talented fighters to emerge on the world Shotokan scene during the 1980's was Great Britain's Ronnie Christopher. Ronnie's relaxed, fluent and spirited fighting style was even the envy of many top Japanese instructors/competitors and as a crowd pleaser, they don't come any better. It was action from start to finish! If you never had the pleasure of seeing Ronnie Christopher fight, (he fought mostly in Shotokan events with the famous K.U.G.B. National team, all over the world, as well in the U.K. and Europe) then hopefully this interview will give you an insight as to what makes someone like this tick. 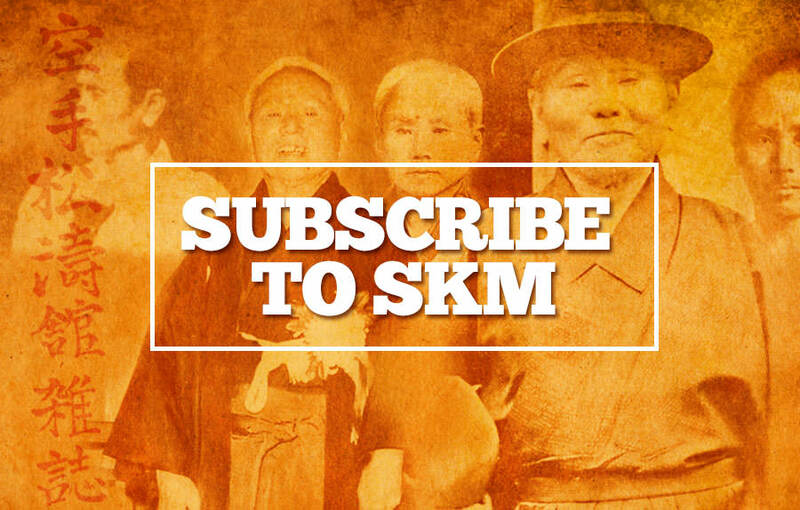 Although winning National and European Kumite Championships, you will also see that Ronnie is a very traditionally minded karate-man and not just someone (although naturally gifted) who is sport/competition orientated, which is of course why he is featured in SKM. Mike Clarke, SKM's correspondent in the Land of 'Oz' (Australia) has done it again and come up with a brilliant interview with Sensei Keigo Abe 8th Dan of the Japan Karate Association. Mike interviewed Sensei Abe whilst he (Abe) was on a teaching trip in Australia earlier this year. So, this is a very recent interview. Thanks once again Mike. Keigo Abe Sensei, who to my knowledge has not been interviewed for many years, comes across as a very relaxed and humourous character with a very humane approach to training and life in general. He was the teacher of many famous Japanese instructors, two of whom will be known to everybody in the Shotokan fraternity worldwide, namely Sensei's YAHARA and KAGAWA. There has been a lot of interest in the subject of TAI CHI and it's connection and relationship with SHOTOKAN Karate, or indeed karate in general. In this issue Ian Deavin, a practitioner of both arts explains some of the relationships between the two in his article 'Moving Across the Spectrum'. I found this to be a particularly well written and educational piece. As usual we keep up with the technical articles, which people seem to really like, with a study of the 'rooted stance', Fudo dachi or Sochin dachi. Please remember that I don't pretend for one moment to be an expert on these subjects, which is why I still train as often as possible with the 'real experts' . Kawasoe Sensei here in the U.K. for instance, and before that with Sensei Kato and earlier with the top K.U.G.B. instructors including Sensei Enoeda and Andy Sherry. However, I feel that I have a very good 'understanding' of what these people 'technically' do, even though I, like most other mere mortals, can't do it very well myself, but we try. So, the point being, many of these technical articles, which are not easy to write by the way, and that is a real understatement, are simply my own observations and interpretations of what the real experts do. A friend of mine is a Technical Analyst who's a Golf nut! He can explain the mechanics of a golf swing perfectly, but he can't hit the ball like Nick Faldo! I hope you are all enjoying the magazine as much as I enjoy producing it. FUDO DACHI - SOCHIN DACHI 'VARIATIONS ON A THEME' By John Cheetham. Broadly speaking, there seem to be three different forms - interpretations - versions - variations or whatever you want to call them for Fudo-dachi/Sochin-dachi. However, none the less, they are different ways and methods of using, performing and teaching 'rooted stance' - FUDO DACHI also known as SOCHIN DACHI because this particular stance is used throughout the Shotokan kata - SOCHIN. In his book 'Karate Training Guide' by Randall G. Hassell, ISBN No. 0-911921-11-7 'Focus Publications P.O. Box 15853 St. Louis Missouri 63114 U.S.A.' (available from Mona Books) the author with reference to the meaning, history and origins of the 26 Shotokan kata described Sochin as..."Sochin - immovable, rooted. Probably created by Ankichi Arakaki and originally called HAKKO. Changed extensively by Yoshitaka Funakoshi, it is practiced today primarily in Shotokan and Shito-ryu." Master Hidetaka Nishiyama from 'Karate the Art of Empty Hand Fighting' (1960). Sochin dachi. The three variations may be confusing to some students but I think that the general rule is over this type of technique, 'don't worry about it' because variations are all they are. There is no right or wrong way, just different interpretations and methods. As a general rule you should follow your own sensei's teaching method. Then later after many, many years of study and practice, maybe discover what's best for you. And hopefully find which form suits your body and personality the best. A diagonal kiba dachi (sometimes with slightly more weight on the front leg). This method is used by many of the senior JKA instructors, both past and present since about the late 1950's and early 1960's. The front leg is in zenkutsu dachi position (forward stance) and the back leg is in kiba dachi position (side stance) with the heels in line (a very narrow stance). This is used and taught exclusively by the Shotokai school and more recently (from the early/mid 1980's) by Sensei Kase and many of his students. 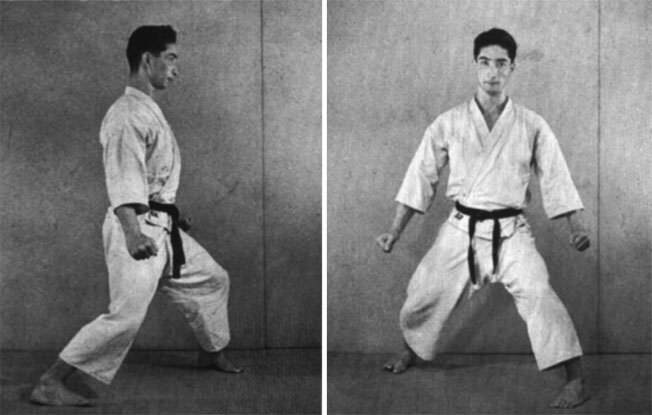 Many people say that this stance was devised and created by Yoshitaka Funakoshi (Master Gichin's son) who's nickname was Gigo, or some say Giko. 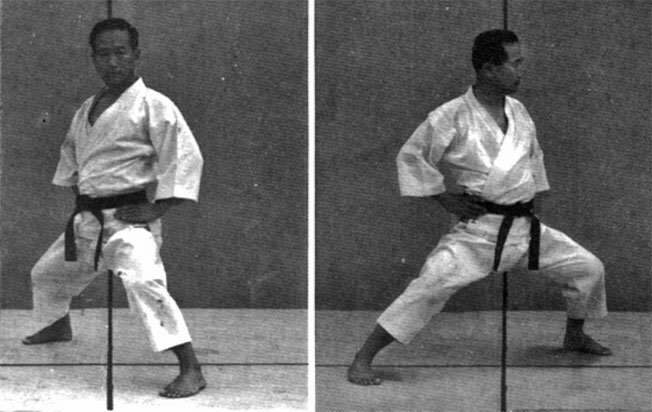 This is the same stance (version) as described in (2) above, but the difference this time being that the feet are about shoulder-width or hip-width apart, as in forward stance and not with the heels in line as in kokutsu dachi (back stance). This is probably the most practiced method in the Shotokan system and used by many senior instructors from the various groups. All three versions use 'outside tension' of the legs. This is a very important point about this stance. This helps give the stance the feeling of being 'rooted' to the ground. In the classic Shotokan books by Masters Nakayama and Nishiyama, Fudo dachi or Sochin dachi is basically described as a diagonal kiba dachi (straggle leg stance). No one really knows which stance came first in karate but kiba dachi is definitely a good guide for learning purposes and possibly the key to all the others, especially Fudo dachi. I have heard it said that fudo dachi is the 'old' stance of karate. It is certainly one of the most natural, especially for blocking and evasive techniques and tactics. Lets hear what Masters Nakayama, Nishiyama and Kanazawa said in their books about the rooted stance. "Diagonal straggle leg stance (sochin dachi) is the straggle leg stance twisted forward. The front knee is over the big toe, while the rear knee is about one foot forward of the big toe. Body weight is evenly distributed on both legs and both knees are bent and tensed outward. Legs are about twice shoulder with apart, or as seen from the front, shoulder width apart. This is a strong stance both to the sides and front and to the rear and is effective both in attack and defence. As in the straggle leg stance, the bowing of the legs is very important." (See photo's of Nishiyama Sensei above in Sochin dachi here with hips square-on). "Place both feet two shoulder widths apart in length, with the knees bent and tensed outward. Put slightly more weight on the front leg." The Shotokai school use fudo dachi almost exclusively and their stance version (as described in No.2 before) is a cross between forward stance (zenkutsu dachi) and side stance (kiba dachi). Shotokai Master, Mitsusuke Harada, the senior Shotokai instructor in Europe and interestingly Sensei Kase (Shotokan) also use this stance, almost exclusively. So, the front leg is in zenkutsu dachi position and the back leg is in kiba dachi position. The stance is very narrow with the heels in line, as in back stance. This stance and body position does not lend itself to a big 'hip twisting' action as forward stance does, but relies more on very strong kime (focus) or yori ashi (sliding forward) with techniques (using forward momentum) for the power, as opposed to hip turning (rotation) and cetrafudal force. Master Nakayama from 'Dynamic Karate' (1966) demonstrates Fudo dachi / Sochin dachi. The third version is used in many Shotokan schools. This is the same as just described with the only difference being the 'width' of stance. So, the front leg is in zenkutsu dachi (forward stance) and the back leg in kiba dachi but the legs are shoulder width apart which facilitates the use of the hips for twisting into zenkutsu with the hips square-on, for impact. For most people this (fudo dachi) variation is probably the most natural position. Most boxers use something like a shorter version of this stance. This is a basic boxing stance. Traditional karate gets much lower for various reasons ranging from - for a lower centre of gravity to make more power - better for leg training and conditioning - more leverage - and so on.... Probably this fudo dachi version lends itself really well to the blocks of karate as a set up for the counter punch/strike, where ideally you want to turn/twist both hips to face what you hit, square-on to the target on impact. So, you can change from say, blocking in fudo dachi to hip-twisting into zenkutsu dachi for the counter punch by altering the position of the back foot/leg. You will be in a very deep forward stance after hip turning into your punch. You don't have to change the position of the front leg because it's already in forward stance position. Unlike the sochin dachi as described before as a diagonal kiba dachi, this again is difficult for a 'big' hip turning action, although it is of course possible to use the hips in this sochin dachi as is done in the kata - Sochin, on the double punches. It is definitely 'not' just an arm action. If you ever need conformation of this, then have a look at and watch carefully when OSAKA demonstrates on his Sochin kata video (Hisha videos) or KAWAWADA doing Sochin on the JKA Standard Kata series Vol 1 (SKM videos Tape 4). They both use a fantastic hip-action on the double punches. Not as big an action as if you were in forward stance, or if you were changing into forward stance, but none the less, a very obvious and dynamic hip-action without moving the feet. On Kanazawa Sensei's Kata tape he does this movement from CHINTE by....using the diagonal kiba dachi version of fudo dachi and sharply turning the front foot in on the stance change from fudo dachi to zenkutsu dachi. (The back foot also moves with the speed of the hip-turn). 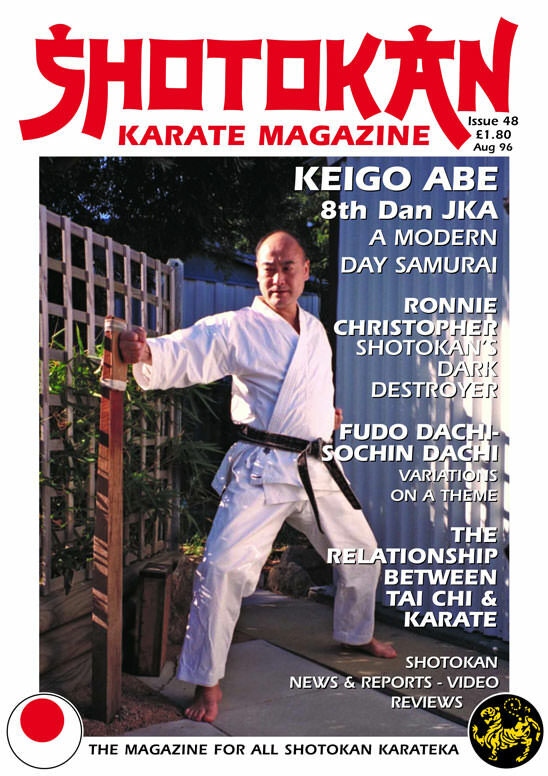 Sensei Keigo Abe 8th Dan (featured in this issue) does this same movement from kata CHINTE on the JKA Standard Kata series Vol 2 by....using a diagonal kiba dachi version of sochin stance and moving the front foot slightly to change into zenkutsu dachi for the tate zuki punch. His back foot does not appear to move, just the hips. On a tape I have of Sensei Hitoshi Kasuya 7th Dan, the Chief Instructor to W.S.K.F. and former JKA Kata team Champion (along with Osaka and Yahara) he does this same movement by using the diagonal kiba dachi version (slightly more weight on the front leg) and fast hip twisting into the tate zuki into the palm of the hand by slightly moving the front foot inward. (Again the back foot moves slightly because of the speed of the hips and technique). On several other tapes I've watched, many of the JKA people 'only' move the 'back' foot because the front foot is already in forward stance position. Fudo dachi definitely lends itself to this type of stance/hip changing action and is ideal for blocking fast kicks and countering etc., and has a very 'natural' feel about it for most students. If you partner up with someone from your dojo and one person attacks (as fast and strong as possible) with say, mae geri, you can bet your life that the other person who moves out of the way and blocks or evades will end up in something resembling fudo dachi because it is so natural for Shotokan students after a few years training. It naturally lends itself to this type of movement. Finally, to sum up, there are different variations for Fudo dachi as with all techniques. Hopefully, with continuous training you find out which is best for you. I can't wait!! Enjoy your Training.